In wildlife photography, it is a rare occasion when you can conceptualize and carry out a specific image you have in your mind. This is obviously due to the fact that wild animals do what they want. A wildlife photographer usually has no control over a particular shot. Animal photos come down to making the best of what nature, and the particular creature being photographed gives you. Every now and again though, you find a perfect scene where all the pieces fall together that enable you to truly compose a photo exactly the way you see it in your head. 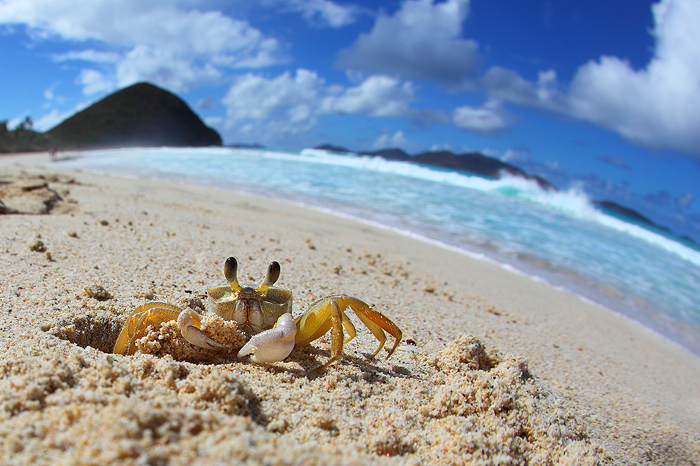 Such was the case with this little ghost crab I found on a beautiful day in Tortola. While relaxing on the beach one afternoon this tiny crab popped out of the sand about 20 feet in front of me. It was incredibly shy and shot back down into its hole any time I tried to stand up and look at it. As I lay there and watched this little sand crab excavating, I started to conjure up an image in my head. If I could get my fisheye lens close enough to the hole at sand level, while still keeping the beautiful landscape, sky and ocean in the frame, then I could get an image that conveyed what the world might look like through this little crabs eye. I didn't have a tripod with me so I dug a small pit a few inches away from the crab's hole, so that I could sink my camera lens to the beach level. I then stuck a towel in the hole to attempt to prevent getting any sand on my equipment. I laid on my stomach and looked through the viewfinder and lined up everything just how I wanted. In my dreams the crab would come out of its hole and I would capture this image I had in my head. I really had no hopes that it would work after seeing how shy the crab was, but hey, I was just laying on the beach as it was, so what did I have to lose. Once I had my shot set up just how I wanted I attached my shutter release cord and moved back as far away from my camera as the cord would allow. In only a matter of moments the crab peaked out of the hole, but disappeared before even his legs made it onto the beach. This went on for a matter of minutes, but to my surprise after a bit of sitting still, the brave little crab came all the way out of its hole and went about its business of excavating. I shot off a few frames and then removed my camera so that I wouldn't disturb the crab any longer. I still wasnt sure if I got the image I wanted but when I reviewed my shots later I was delighted to see this photo that I had conjured up in my head had been perfectly realized through my camera.